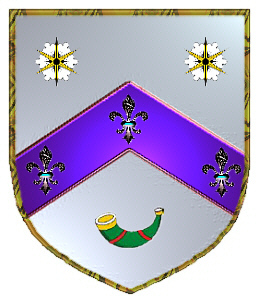 Coat of Arms: Silver with a chevron between two spur rowels and a hunting horn in base, three fleur de lis. Crest: A hand holding a hunting horn. BURNS (British). Possibly a modern form of the ancient Irish name "O'Conboirne". The surname of Burns comes from "Burnhouse" a dwelling near a burn or a stream. Although "burn" is a common word in Scotland for a stream, the word originated in Old English. The singular form "Burn" is found in Dumfries and Galloway in the 13th and 14th century. The poet Robert Burns' father came from Kincardineshire on the east coast of Scotland and spelt his name Burness. Robert and his brother adopted the spelling "Burns" a form which first appeared in written records only in the 17th century. 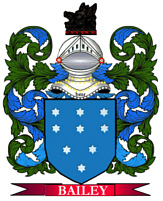 Burns is regarded as a sept of clan Campbell.Burns was the 60th most frequent surname at the General Register Office in 1995. Definition: This geographical surname comes from the Middle English "burn," meaning 'stream or creek,' usually referring to to someone who lived close to a river or stream. See also, related surname BURNESS. Spelling variations include: Burns, Burnes and others. Some of the first settlers of this name or some of its variants were: Archibald Burns who settled in Philadelphia Pa. in 1850; Bernard, Catherine, Charles, Daniel, Edward, George, Henry, James, John, Joseph, all arrived in Philadelphia between 1840 and 1860. It is likely that the name comes from one of the places in Scotland with a similar spelling or sound. Robert Burns, a farmer in Kincardineshire, had three sons. His elder son, Robert (1759-96) dropped the 'e' from his name, and overcame the handicap of a disadvantaged childhood to become the most famous, and many argue the finest, of all Scottish poets. He wrote equally well in English and in Scots and within a comparatively short period of a life composed numerous technically gifted love songs, satires, nature poems and depictions of rustic life as well as Tam o' Shanter, his version of a scary folk tale which is today recited all over the world on his birthday.